I was hoping Quinnen and Irving would stick around another year but they are both playing at such a high level it probably won't happen. Is the NFL the only league which condones getting rid of good players(tanking) to be a good thing? To me that is the dumbest thing I've ever heard. The raiders for example have no one left. And it shows. The mindset that its ok to lose is crazy. Tanking doesn't really work in the NFL. NBA does it though and it kinda works. 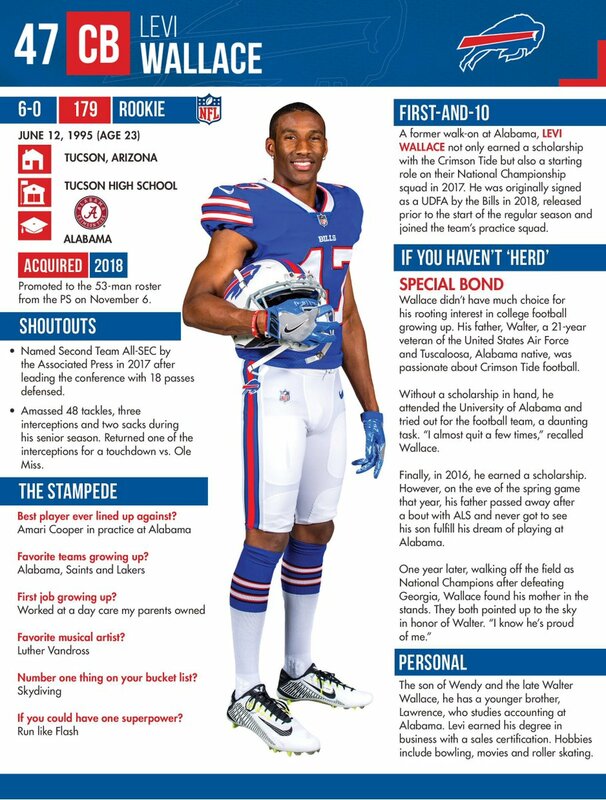 Levi Wallace has been promoted to the main 53-Man Roster for the Bills!!! Dude is one of my favorite former players..... Super Hard Worker!!! I wouldn't doubt him accomplishing anything he wants in life. Bleacher Report's NFL draft analyst/scout Matt Miller has his big board (top 32) out today in his weekly scouting notebook. Looks like the Titans are through with D. Henry. Tried to trade him and only getting a handful of touches per game. Such a shame because I think the guy wants it so bad and he could be an everyday back. Unfortunately he is at his best when he gets 25 carries a game and needs an offense built around the running game (like the Titans the last 2 years). Maybe he will get another chance with a team more suited for his game. Heck it took the Saints a year or two before they realized how good they could be with a running game! They are not using him right. This new coach has no idea how to use him...none at all. If you don't want to run him 25 times, then throw it to him out of the backfield for crying out loud. They did resign Jalston as a way to have a power blocking back -- but then had him inactive for the last game. How do these coaches get these jobs? The Titans have gone backwards, big time. Lot can change between between now and Jan.... I'm little surprised Raekwon Davis is at #15, given his performance this season for most part. I understand he's getting double teamed a lot, but so is Q. Williams. Just amazing! Mack just need to improve his draft stock by being consistent with his game. Mack is probably gone this year.. no matter what we think... I don't know how he can improve his stock next year. I expect Irv Smith to be in top 20 when it's over and done with. Yup. Over and over over the last 2 years he has been deadly in the 2nd half, hitting home runs of 50 plus yards. He got , what 4 touches in the 2nd half Monday night? Patriots could pick him up or Atlanta. Think he'd be good there. All of the Bama guys are either juniors or RS sophomores. Can you imagine how good we would be if all these guys came back for '19. Our junior class next year will have a bunch of 1st rounders also.